The Rhodesian Ridgeback originated in South Africa where it was used as an all purpose hunting, companion, and protection dog by the native tribes of Africa. It is said to have been created from crossing dogs brought from Boer in the 16th and 17th centuries. In 1877, Reverand Helm brought two of the breed in Rhodesia where they became popular with large game hunters, giving it its name. By 1950 the breed was introduced into the United States and was then recognized by the AKC in 1955. Today the breed makes for a great hunter as well as loyal companion although they are not recommended for homes with small children. The breed has been known under many names including African Lion Dog, Van Rooyen's Lion Dog, and African Lion Hound due to their ability to help their owners hunt lions. 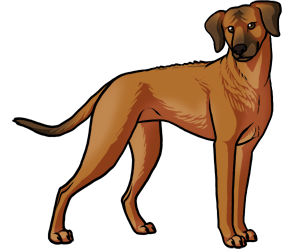 The only trait that could get a Rhodesian Ridgeback disqualified is the absence of a ridge. Although currently classified in the "hound" group, there have been many disputes on where exactly the breed fits best.